it was just over a year ago that we moved to the USA. It's been a blast so far! I was very taken recently by a new painting on the Colonial Arts website, owned by James Eddy. 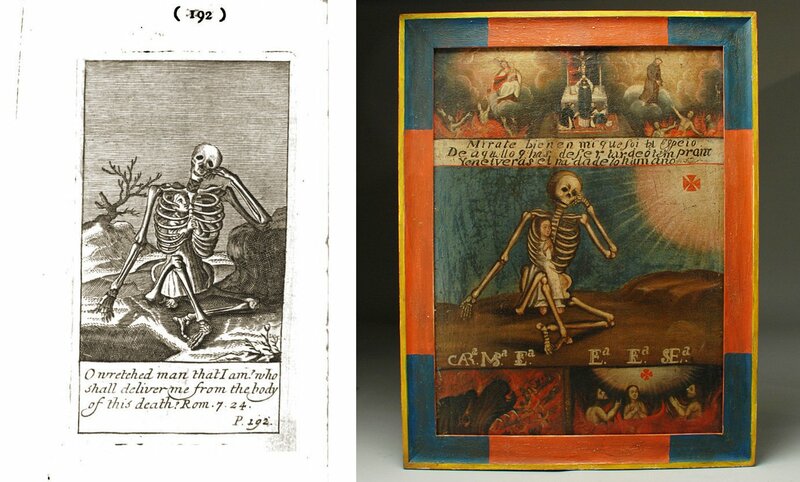 The painting (on the right) is titled 'The Nothingness of Man', c.1700's (http://www.colonialarts.co​m/products/sk) and the central skeleton figure with the figure captured in its ribs sparked off a memory of the work it is probably based on. I found it yesterday in Hermann Hugo's Pia Desideria (Divine Addresses) which was published in 1628. I'm aware of other example of this biblical ribcage jail motif, but I think it is in a book that's in storage in NZ. 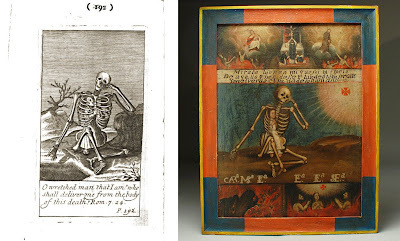 On my facebook page, I put together a folder of images called 'Influences of Spanish Colonial Art on Contemporary Painting', which looks at the lineage of imagery borrowed from the Spanish Colonial period by Enrique Chagoya, Manuel Ocampo, Fred Stonehouse, Frida Kahlo and Alex Chavez. The images below will probably be the offshoot of the above research.